I am so putting some money on the Jets this weekend. Anyone want to make any friendly wagers? Really? That is like playing the any 7, poor odds! Best of luck, it should be a great game. 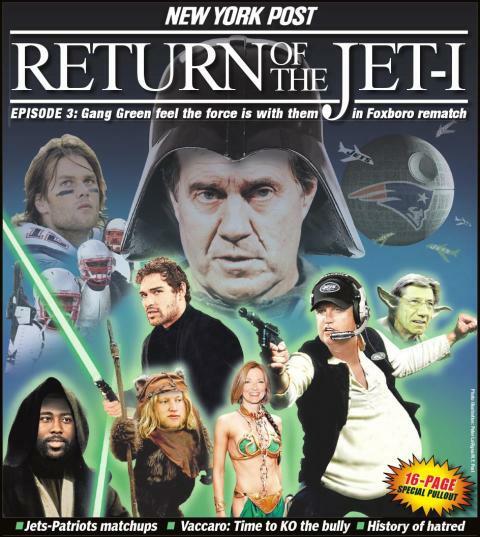 Unless Brady doesn't show up, the Pats are going to kill the Jets again. I am not a fan of either team, but the Pats are playing great and Brady has had a tremendous year. Steve, I hope you bet the money line. While we were watching the game, I saw that Belichik had his hood up. I said to my wife, "He's borrowing his fashion sense from Emperor Palpatine." Then I saw this. Perfect! Who gets to be Jar Jar Binks?